I met my friend David Walker today at Laughing Planet on Belmont for lunch. I’ve been to the restaurant many times but today as we were finishing up our lunch it struck me how much I enjoy eating there and just how consistently dependable it is. 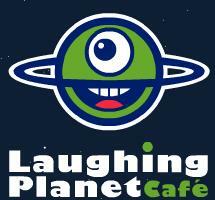 What makes Laughing Planet works so well is that they’ve got a very simple concept – healthy bowls and burritos with lots of options. Being Vegan I appreciate just how many vegan friendly choices they have on the menu, and with a fair share of meated options it’s an easy choice when meeting a friend whose omnivorous. I also like that you can add tofu or tempeh to any of their options. Although I’m Vegan I can’t say I have much love for tofu. It’s “OK” and if prepared right I can enjoy it. I enjoy the tangy almost nutty taste of tempeh much more and always feel more full than when scarfing down tofu. I’m also a fan of seitan and it’s various ‘fake meat’ forms. Its easy not to appreciate some of the good things in life, especially places we visit on a regular basis. They fade into the fabric of things and so it’s nice to just stop for a moment and say… Wow, this place is really something…I’m glad its here!